When it comes to sport, Australia’s pride and joy is definitely Australian Rules Football. No matter where you are in the world, Australians are known for their game, ‘Aussie rules footy’. Find out all about this wonderful sport backed by Aussie Spirit. Australian Rules Football also known as Australian Football or Aussie football has a rich history. Evidences of the first football matches played can be traced back to 1841 and 1843 in Victoria and Adelaide. The earliest match recorded was between Scotch College and Melbourne Grammer School on the St. Kilda foreshore in 1858. The first official body to govern this sport was the South Australian Football Association and Victorian Football Association in 1877. Since then, Australian Football has come a long way towards having the highest spectator attendance of all sports in Australia. Nowadays, the sport is also played at amateur level in many countries and in several variations. Aussie Football is played with 2 teams, 22 players on each side with 18 players from each team on the field. The ball and the field are oval in shape. The field has a total of 4, 2 long and 2 short posts on either side of the field. The field has a square marked in the middle in which the game play starts. The 4 players are reserve on the bench and 3 can be substituted anytime during the gameplay. There are a total of 4 quarters in the game each 20 minutes. There is a 6 minute break after the 1st and 3rd quarter and 20 minutes break during half time. The game is regulated by a total of 9 umpires, 3 within the playing field, 4 boundary umpires and 2 goal umpires. The most prestigious competition in Australian Football is Australian Football League or AFL which is governed by the AFL Commission. Due to its increasing popularity, many variation of Aussie Football can be found but here we describe the generally way of how the sport is played. The 36 players on the field are allowed to place themselves in any positions without any set position or offside rules, however only 4 players from each team are allowed within the center square at every bounce. To mark the start of the game, the umpire bounces the ball in the square circle which is called a ‘Ball Up’ and is done every time to restart the game. After the ball up, any player in possession of the ball must dispose it immediately with a kick, any other method used is called ‘incorrect disposal’, ‘dropping the ball’ or ‘throwing’. A player may run with the ball but must have the ball in contact with the ground at least once every 15 metres. The ball can be propelled in any direction by foot or clenched fist (handball or hand pass) and the opposition may prevent the pass by punching the ball which is known as ‘Spoiling’. After a player takes possession of the ball that has travelled more than 15 metres from a kick from his fellow team mate by a way of catch, the player may choose to ‘Mark’ (claim a free kick), or choose to ‘play on’. The opposition may bump or tackle the player who is in possession of the ball. During the tackle the player who’s holding the ball must dispose the ball prior of being tackled or will be penalised for holding the ball. A player may tackle another player only between the shoulder and knees and not from the back. A free kick is awarded to the tackler if the player in possession of the ball does not dispose of it or attempt to do so within a reasonable time. This is also called ‘holding the ball’. If a player holds or tackles another player who is not in control of the ball, it’s called ‘holding the man’ and the opposition will be awarded a free kick. When a player successfully propels the ball through the 2 inner long posts in the middle by a kick he scores a goal and the team received 6 points. When the ball passes between the shorter outer post and the longer inner post it is called a ‘behind’ which is worth 1 point. If the ball comes in contact with any other player or the post and then crosses the post, it is also a behind rewarding 1 point. ‘Rushed behind’ is a situation where the opposition deliberately scores a behind for the attacking team in desperation just so the attacking team cannot score a 6 point goal. The goal umpire signals a goal with two hands raised at elbow height, a behind with one hand, and then confirms the signal with the other goal umpire by waving flags above their head. The way scores are read: Match between A team and B team, A team scores 8 goals and 6 behinds equaling 54 points. B team scores 5 goals and 7 behinds equaling 37 points. Additionally “A defeated B by seventeen points”. 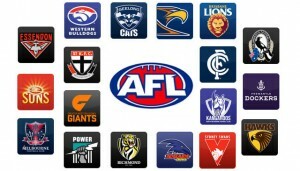 One of the first leagues in Australian Football was the Victorian Football League formed in 1877 which later changed to Australian Football League in 1989. The AFL Commission founded in 1985 governs the Australian Football League and also administers Australian Rules Football. The football teams participating in the league elect the eight members making the AFL Commission. Currently there are 18 teams participating in the competition: 10 from Victoria, 2 from New South Wales, 2 from Queensland, 2 from Western Australia and 2 from South Australia. Among these teams, Charlton F.C and Essendon F.C. have both capped 16 titles, the highest in the league but Collingwood is not far behind with 15 titles. 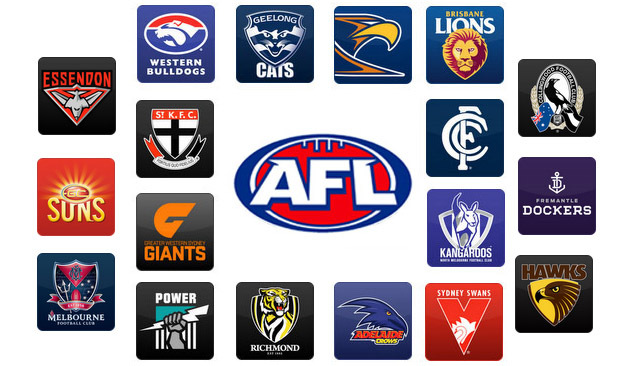 The AFL starts late March of every year and ends in September. Each team play 22 matches and receives 4 premiership points for every win and 2 points for a draw. 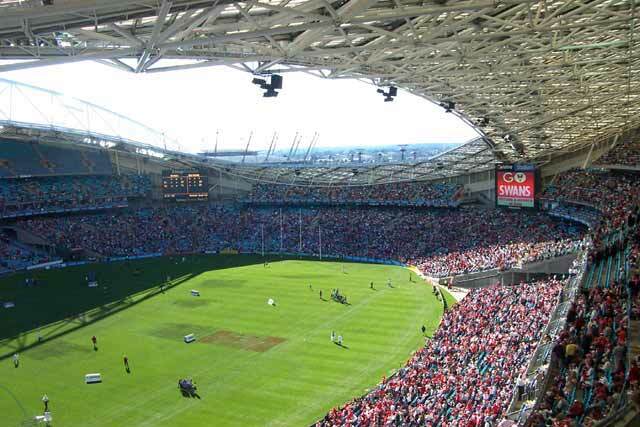 Towards the end, the top eight teams in the league play the final series in the last 4 weeks of September and the AFL Grand Final is played at the Melbourne Cricket ground.